I generally can be found in a dress or skirt on the rare occasion I am in jeans I love dressing them up with accessories. The ultimate way to dress up a pair of jeans is a blazer. A good blazer takes an outfit to a heightened level of sophistication and style. I consider a blazer to be a closet staple and worth a bit of an investment. 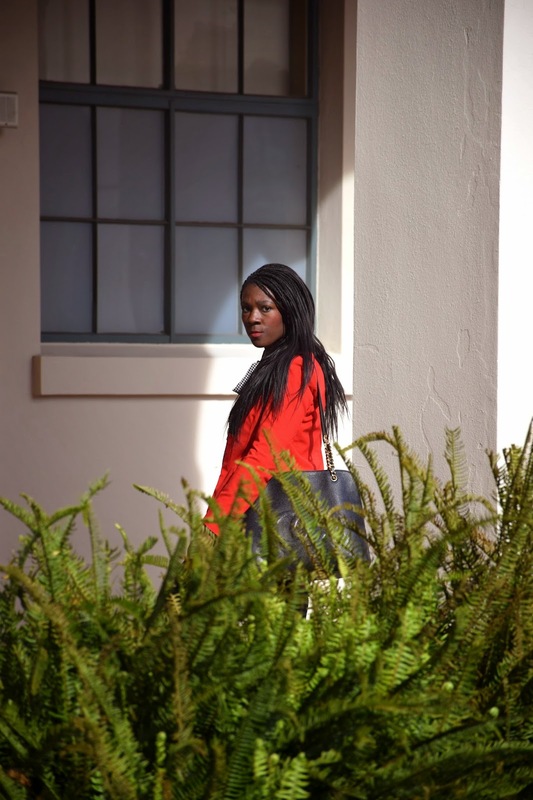 This week I am showcasing my favorite red blazer anytime I wear this piece I feel confident and ready to take on the day ahead. Don't forget to enter this fantastic giveaway to Club Monaco! Love that firery blazer on you, doll! Thanks Ashley red is one of my favorite colors to wear. Well you certainly can rock a pair of jeans! Love all the accessories you added...great look! Thanks Shannon it is rare but fun every once in a while to wear jeans. Loving the color of this blazer!! Thanks Alecia red is one of my favorite statement colors. I love a good blazer, except I don't own one…I don't know why! I love your red one and the shirt underneath is perfect. All your little accessories are amazing too! Thank you Megan you are too kind I appreciate the complement. Thanks Jackie the shoes are an oldie but goodie I am attempting to shop my closet a bit more this year. I love the way the Tory for fitbit acessory dresses up the fitbit it truly is a great collaboration. That red blazer looks gorgeous on you! Really love the shoes as well! Love the red blazer! What a fun addition to any outfit! Drooling over that bag. Lovely look! Thanks Ladies Chanel gets me every time. I could not agree with you more. A blazer totally kicks the look up a notch! This one is gorgeous and looks amazing on you. That fiery red is smokin'! Thanks Ivete I love a good blazer. 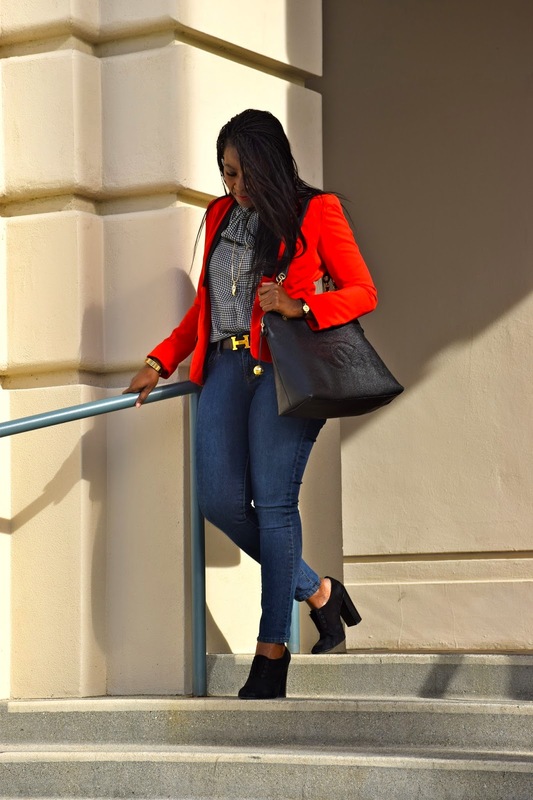 I love this Blazer and I love how it fits you and the color is just to die for! You look fabulous! Thank you Victoria, I appreciate it! You look gorgeous in this blazer! Cool jeans and great outfit! 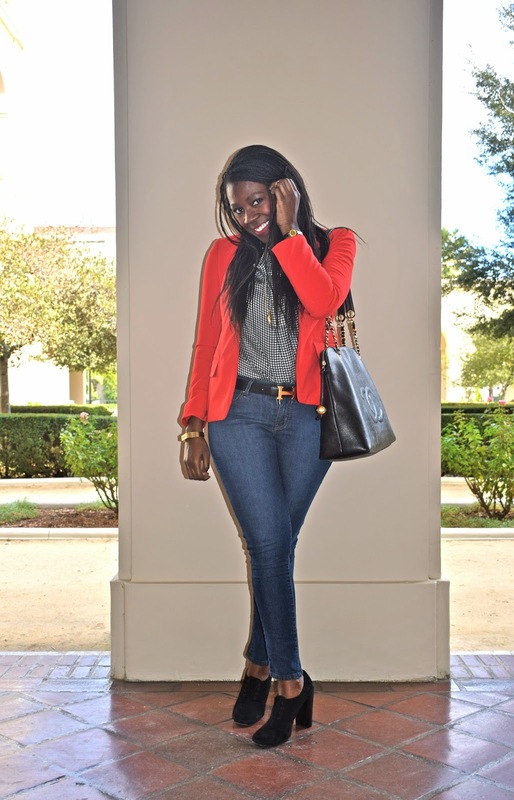 Love the color of your blazer, looks amazing on you! I love the red on you! You look so pretty! You are too sweet thanks Shauna! That's a gorgeous blazer! Love it! I love your bright blazer!! You look absolutely fabulous! Thanks Joanna it is nice to wear a bit of color every now and then. 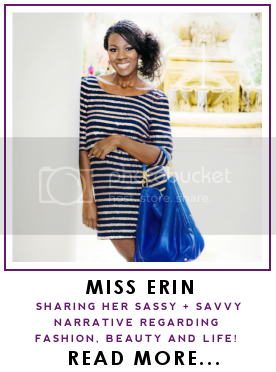 Thank you so much for your kind words I will be sure to check your blog out! Looks good with the jeans!